Gastro esophageal reflux disease is associated with pregnancy, obesity, scleroderma, hiatal hernia, tobacco and alcohol. Patient who suffer from gastroesophageal reflux disease may complain of heartburn. The heartburn is worse typically while the patient is lying down, after meals and when bending. The symptoms typically relieved by the intake of antacid. Patient with gastroesophageal reflux disease is treated with antacids, proton pump inhibitor and H2 receptor antagonist. Pathologically, gastroesophageal reflux disease is associated with loss or decrease in the muscle tone of the lower esophageal sphincter/incompetent lower esophageal sphincter. 1.Shaheen N, and Ransohoff DF. “Gastroesophageal Reflux, Barrett Esophagus, and Esophageal Cancer: Scientific Review.” JAMA 287, no. 15 (April 17, 2002): 1972–1981. doi:10.1001/jama.287.15.1972. 2.Demeester, T R, L F Johnson, G J Joseph, M S Toscano, A W Hall, and D B Skinner. 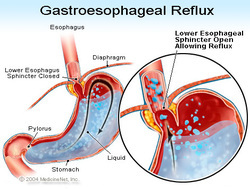 “Patterns of Gastroesophageal Reflux in Health and Disease.” Annals of Surgery 184, no. 4 (October 1976): 459–470.